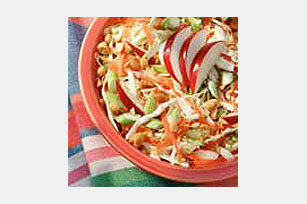 Crunchy, flavorful and colorful, this Slaw with Nut Dressing looks right at home on any festive table. The fact that it's a Healthy Living recipe? Bonus. Place dressing, juice, vinegar, 1/4 cup of the nuts and the sugar in blender; cover. Blend until smooth. Add dressing mixture; toss lightly. Sprinkle with the remaining nuts. Substitute an apple for the pear. Dressing mixture can be prepared ahead of time. Cover and refrigerate until ready to use as directed.